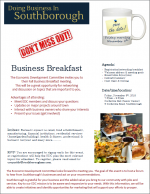 The EDC’s goal is to hear from Southborough’s businesses and act on their recommendations. The breakfast will take place 7:30 – 9:30 am at Cordaville Hall (aka the Senior Center), 9 Cordaville Road. 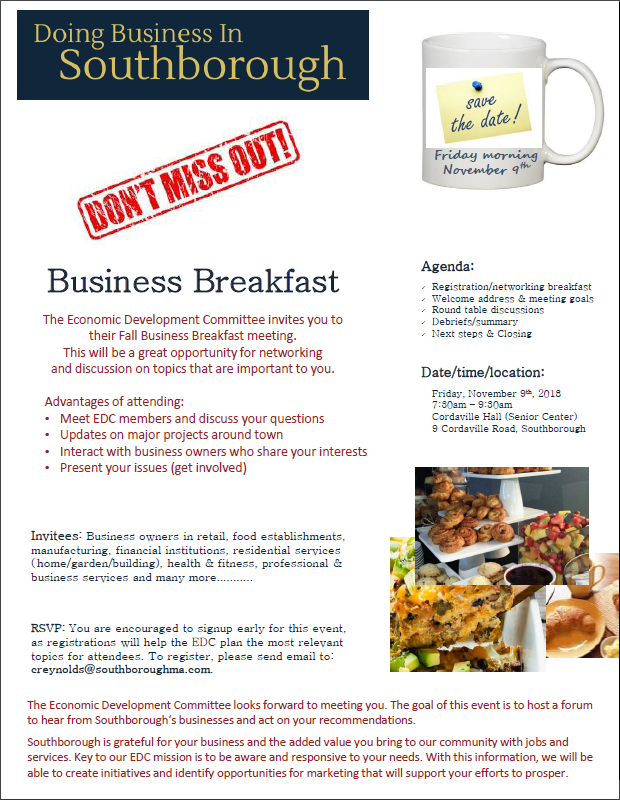 Participation will include discussing ideas, issues and requests that you have for the EDC to act upon. The event will begin with networking, welcome and session goals. Based on RSVPs, round table discussions will follow. The discussions with be relevant to the participant’s business interest. You are encouraged to signup early for this event, as registrations will help the EDC plan the most relevant topics for attendees. To register, please send email to: creynolds@southboroughma.com. Updated (10/24/18 3:24 pm): The EDC sent a fixed version of the flyer.